Of the many meals which can be cooked with the Silex, one of our favourite would have to be Garlic and Rosmary Lamb, a classic Winter family favourite…enjoy! 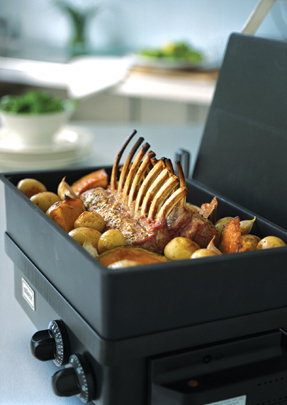 Place lamb in Silex baking dish. Make a few slits in lamb with the point of a knife. Mix garlic and rosemary together. Press garlic mixture into slits. Brush lemon juice over lamb. baking dish. Place baking dish into the Silex and secure in place. minutes or until lamb is tender. If necessary, turn roast once or twice during cooking. Clean the kipfler potatoes and place them in with the lamb 15 minutes into the cooking process. Serve lamb with potatoes and pan juices. Posted by Piotis Admin on June 12, 2014 in News.